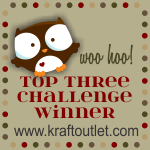 The Kraft Journal hosted by KraftOutlet.com: We Have Winners! Hi all and welcome to the Kraft Journal. Every Friday we announce the Top Three Winners from our challenges and today we have the Top Three picks from Challenge #253 Santa or Snowman. This BEE is happy to bee selected in the Top 3 for Kraft Journal Santa or Snowman. 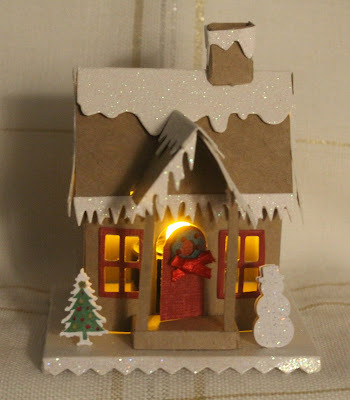 I put a lot of work into the Tim Holtz Village Dwelling Winter House. My hubby helped assemble the roof, chimney & dormer part of roof. Congrats to the other Top Winners. Merry Christmas to all. Earlier I left a comment asking about what was on sale at the KJ store and did not see a response. When I click to go to the store I see a note indicating sale but nothing telling me what is on sale. I wanted to buy some Lt Kraft & Buff Ivory cardstock but that does not appear to be on sale. 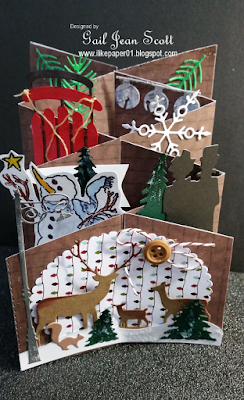 Congrats to all of the winners - and thank you for selecting my card as a winner too -Happy Dance! Good suggestions - Incidentally , others have been needing a a form , my business partner edited a blank version here https://goo.gl/C3IkkJ.